ITIC-DCl, one of the out-performing ITIC family members, is always used as an acceptor material to replace fullerene in non-fullerene organic solar cells (NFA-OSCs) or non-fullerene polymer solar cells (NFA-PSCs). When compared with IT-4F (ITIC-2F), ITIC-DM exhibits lower HOMO/LUMO energy levels due to the partial larger dipole moment of the chloro-containing molecules. Together with IT-2Cl as an acceptor material, ITIC-DCl achieved a power conversion efficiency (PCE) over 14% when PBDB-T-F was used as a donor polymer material. Devices architecture: ITO/PEDOT:PSS (35 nm)/PBDB-T-2F:IT-2Cl(20%):IT-4Cl(80%) (95-100 nm)/PFN-Br/Al (100 nm). 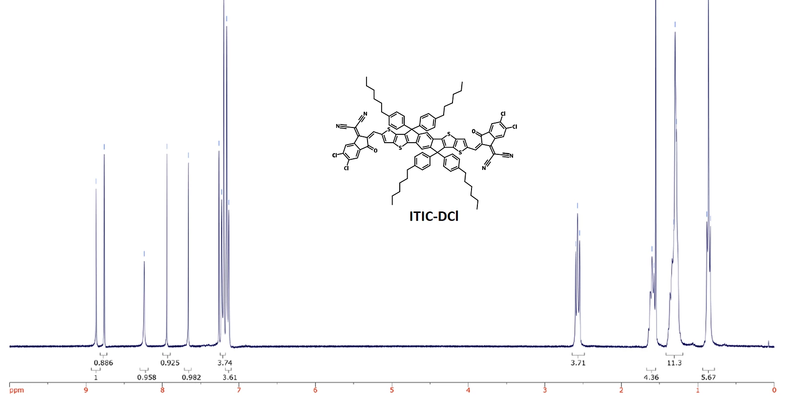 1H-NMR spectrum of ITIC-DCl in CDCl3 (see the full version). Over 14% Efficiency in Organic Solar Cells Enabled by Chlorinated Nonfullerene Small-Molecule Acceptors, H. Zhang et al., Adv. Mater., 30, 1800613 (2018); DOI: 10.1002/adma.201800613. Fluorination vs. chlorination: a case study on high performance organic photovoltaic materials, Y. Zhang et al., Sci. China. Chem., 61 (10), 1328-1337 (2018); doi:10.1007/s11426-018-9260-2. Morphology Control Enables Efficient Ternary Organic Solar Cells, Y. Xie et al., Adv. Mater., 30, 1803045 (2018); DOI: 10.1002/adma.201803045. Nonfullerene small-molecule acceptors with perpendicular side-chains for fullerene-free solar cells, F. Shen et al., Mater. Chem. A, 6, 15433 (2018); DOI: 10.1039/c8ta04718a.